When we go out for Chinese food, one of us always orders this dish. Instead of adding the vegetables to the chicken, I added them to the rice which keeps them from being overpowered by the sauce. Heat a saute pan to medium high and then add the chicken to brown (heating the pan first, then adding the oil makes it less likely to stick). When the chicken starts to brown add the cashews. When the cashews become fragrant add the sauce and stir until thickened. In another saute pan heat the butter and add the snow peas and the savoy cabbage. Saute the vegetables until tender and add the cooked rice and heat through. Top the rice and vegetable mixture with the chicken and serve. 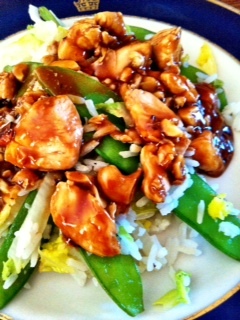 This entry was posted in Recipes and tagged Cashews, chicken, Chicken Breasts, hoisin sauce, Savoy Cabbage, Sesame Oil, Snow Peas. Bookmark the permalink.